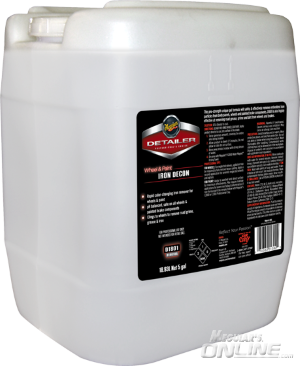 This pro-strength unique gel formula will safely & effectively remove embedded iron particles from body panels, wheels and painted brake components. D1801 is also highly effective at removing road grease, grime and dirt from wheels & brakes. Be warned - this was built to CLEAN and REMOVE IRON, and come loaded with iron-killing stink! Happy with this!!!! Cant wait to see how it works on a white car!!!! 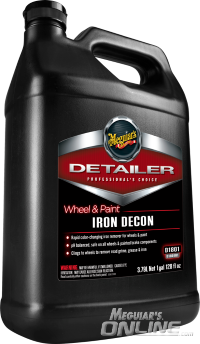 Great addition to Meguiar's Family of Detailer products. Are you going to come out with a dedicated spray bottle? Or is the low pressure sprayer preferred? Any plans on making a 32oz version?, I'd like to get my hands on this but that gallon price is a little too steep, I'd even settle for a 500ml version. So judging by you guys stating it stinks, it doesn't have a nice scent to it?. I highly doubt that there will be a smaller version, that's just not the way things work in the Detailer Line. I actually think the price for the gallon is a very competitive price vs. many of the other similar products. And I guess if you are looking for a nice scent, you are unfamiliar with the "iron-eating" family of chemicals. They have an unpleasant, lingering odor. If you know what hair perm smells like, it's the same, because it's the same family of chemicals. Yes, dedicated, screen-printed, secondary bottle will also be coming out. I just don't have the product images for it yet to display. BTW, this product is RTU (Ready to Use) in case any one is wondering. No Plans. The pricing is competitive for the size. Does not have a nice scent at all, it stinks like rotten eggs, but, that is kind of the way it is with the color changing ingredient being part of the product, it smells foul. @setec astronomy I know iron chemicals stink but there are other companies out there that try to mask or reduce the stench of the chemical by putting a citrus or berry scent to it that's all I was asking. I'm very familiar with these types of iron eating cleaners and believe it or not there are some that smell worse than others. They don't all use the same thioglycol, that accounts for the difference in the smell. The lemon scent etc. doesn't really do anything except try to take your mind off of it. The only iron-eater that doesn't smell like that uses a different active and produces more of a red-orange bleed vs. the purple. Is this also going to be good as a tar remover? Or just light grime?